The centenary of the first entry of the Royal Australian Navy’s fleet into Sydney will be commemorated in October 2013. Both naval and tall ships have been invited to Sydney to celebrate the event. Indications are that there will be six international tall ships coming to Australia for the occasion. I happened, by pure co-incidence, to be in Perth five weeks ago when the three Dutch tall ships arrived in Australia from South Africa via Mauritius. They’d come into Fremantle (Perth’s main port) a day before the official welcome, I suspect to avoid some pretty foul weather that was on its way. I wonder where these ships hail from? The Oosterschelde flying the Dutch flag with the Europa behind. 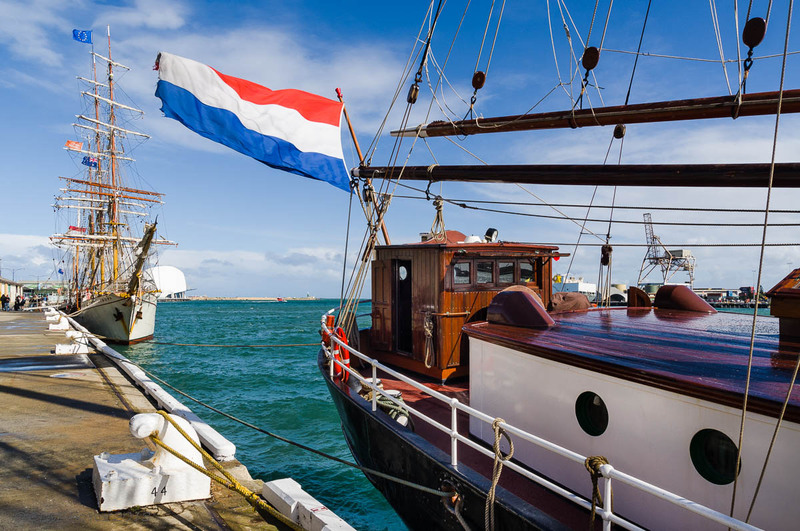 This entry was posted in Boats and Shipping, Other States and tagged Dutch Tall Ships, Duyfken, Europa, Fremantle, Historic Ships, Leeuwin II, Oosterschelde, Photography, Square rigger, Tecla on September 3, 2013 by aussiesouthlander.